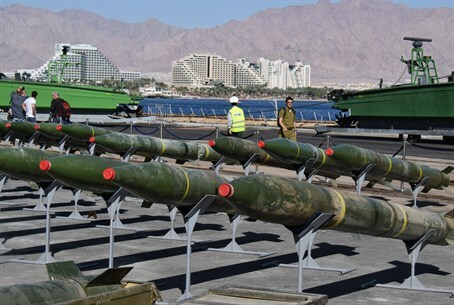 A senior Israeli security source revealed on Tuesday that Iran is smuggling rockets souped-up with advanced guided warheads to its terror proxy of Hezbollah in Lebanon, posing a direct threat to the Jewish state of Israel from right over its northern border. Col. Aviram Hasson, a leader in the IDF's top-level missile defenses, brought up the threat at the Israel Air and Missile Defense Conference held in Herzliya, an event hosted by the iHLS (Israel's homeland security) defense website and the Israel Missile Defense Association. The colonel said Iran is taking unguided Zilzal rockets and upgrading them into guided M-600 missiles by swapping out their warheads with more advanced components. The Islamic regime is a "train engine that is not stopping for a moment. It is manufacturing new and advanced ballistic missiles and cruise missiles. It is turning unguided rockets that had an accuracy range of kilometers into weapons that are accurate to within meters," he revealed. Hasson stated that Hezbollah "is getting a lot of accurate weapons from Iran. It is in a very different place compared to the Second Lebanon War in 2006." The statements come the same day reports revealed the IDF had updated its worst case scenarios for a war against Lebanon for the first time since 2007. The assessment posited that Hezbollah would hit Israel with 1,000-1,500 rockets every day, and the number of Israelis killed daily will be in double or even triple digits. As far as what Israel can do against the major threat, Hasson said the "ultimate defense is a combination of counter-attack, active defenses, and passive defense," with the later consisting of civilians following orders to stay secure. Also addressing the missile threat at the conference was Riki Ellison, founder and chairman of the US Missile Defense Advocacy Alliance. Ellison remarked that the US has a policy of always leaving a warship with an Aegis naval missile defense system in the Mediterranean to provide Israel with defense from Iranian long-range ballistic missiles capable of hitting the Jewish state from Iran. He described how the warship "can stand off the coast and shoot long-shots coming in from Iran." However, Ellison noted how the US wants Israel to complete developing its missile defenses for all ranges of missiles, through such systems as Arrow 3 and David's Sling, which would free up the Aegis ships. If needed the US could take its defense of Israel a step further, revealed Elisson, noting that Terminal High Altitude Area Defense (THAAD) batteries could be deployed to secure the Jewish state. Even as nuclear talks reached a deadline on Tuesday that was extended by the US, Commander of Iran’s Basij (volunteer) Force, Brigadier General Mohammad Reza Naqdi, said "wiping Israel off the map is not up for negotiation," illustrating the dangers posed by the state's nuclear program coupled with its missile capabilities.